In other words, the key objective every learner of English has is to be able to use the English they’ve learned (grammar, vocabulary, spelling, pronunciation) in a social context. However, it’s not enough to have all the words and grammar and know how to put the sentences together correctly. You need to know how to use the language in context and in the appropriate way. This is especially the case for the English language where there are many expressions you can use to mean the same thing. So, in addition to learning words, grammar, pronunciation and so on, an equally important area that language learners need to focus on is in acquiring life skills. These skills could include learning how to express an opinion, how to disagree diplomatically in English, how to ask for information or clarification in a business meeting or in a social context. I’ve therefore decided to introduce in my blog a series on English Skills. The idea came to me after reading Macmillan Dictionary’s blog. They have introduced their Life Skills series and I think it’s a brilliant idea. I have unashamedly taken their idea and decided to adapt it to my own series. Thank you, Macmillan. In today’s post, I want to look at the different ways we have in English to express uncertainty. These two words are used for saying that you are not certain about something, or that something may or may not be true. I wondered if perhaps he had changed his mind about attending the party. If house prices are low, it’s probably because there is a lack of demand. Apparently, she resigned because she had an argument with her boss. There is, apparently, going to be an announcement about the new CEO tomorrow. these two expressions are used when you have partial (incomplete) knowledge of an issue or fact. No one has complained, as far as I know. As far as I am aware, the invitations to the party have all been sent. To the best of my knowledge, no similar book has been published. These are used when you think something is probably true, but you can’t be sure. “Guess” is more frequently used in American English, although you can hear it in British English, too. “Suppose” is more characteristic of British English and is often used in the negative. I imagine they’ve already left for the airport. It’s difficult, I imagine, to keep the same enthusiasm for the job after 30 years. I suppose she must be delighted about getting the job. I don’t suppose you’d consider staying for another week? I guess he will want to meet all the team members before the conference. Please do let me know if there are any other expressions that I haven’t included here. I hope you found this post helpful. If you did, please share it. And don’t forget to sign up to my free e-guide below and have my weekly lessons delivered directly to your inbox. 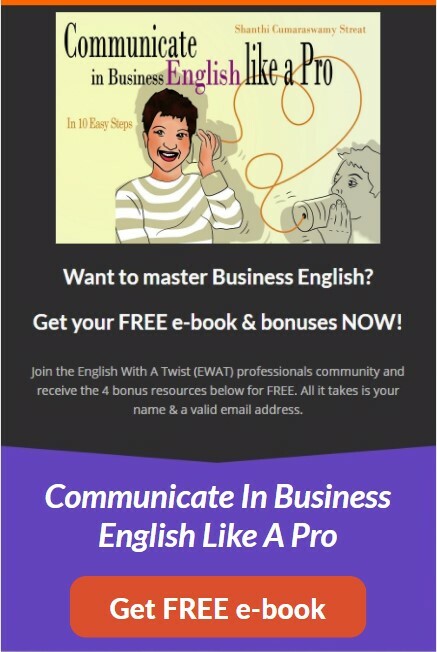 English Skills: 7 ways of saying "I don't know"
Need more help to MASTER Business English? Get your FREE e-book & bonuses NOW! This means that you'll receive my free e-guide + my weekly lessons via email. You'll also be the first to know about any live lessons and events I run. AND you'll receive the occasional email about my products and coaching programs. Congratulations on joining! Please check your email inbox now. Don't forget to claim your FREE e-book! All it takes is your name & a valid email address. This means that you'll also receive my weekly lessons via email. And be the first to know about any live lessons and events I run. Send Me My FREE Bonuses!